Owning a dedicated document scanner can help, but it’s not always nearby when we need it. Luckily, ever since the iPhone’s camera gained sufficient resolution to capture crisp text, there are many document scanning apps that have put the possibility of going paperless much more in reach. But, how to find the all that has all the features you want for your scanning needs? We looked and we found one great and highly productive app for your scanning needs. Let’s what this app is all about. This app is an amazing tool to turn the phone into a scanner. 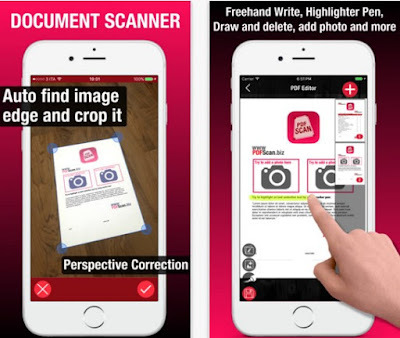 Easy and simple to use, developed for IOS users, this app gives many option to scan documents, edit, sign, and share the edited documents into a PDF format. This app gives the users more than scanning option, also, the app gives the users options to use the app for scanning old photos, edit photos from gallery, create cards or flyers. The right app to make your documents organized and easier to save. Simple and yet, highly efficient app, helpful for users that want to save PDF documents on their phones with scanning them or even edit digitalized images or images from gallery, using only the phone’s camera. With many different features as scanning, editing, sharing, and saving PDF documents, using photos from gallery for adding on the documents, setting resolution and changing the background colour of the paper, this app is practical tool for making the daily life more productive. Also, the users can draw on images, create business cards, or digitalize old photos and save them. Download it on App Store for free.